A small update of how the edits are going. See that outlined box (the one that says 44.16667)? 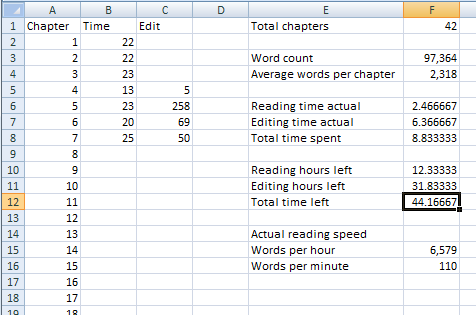 Those are the hours my spreadsheet estimates this edit will take me to finish. That’s all because the edits so far have been outrageously time consuming. I’m very hopeful that’s all about to come to an end though (maybe an hour to go) and I’ll be back to doing my normal style of proofreading edit, which will drive down the editing time to go and make this a more reasonable estimate. Changes always introduce new errors. Therefore, I always try to reread anything I’ve touched for more than a simple typo correction before I claim the book is done.